The story revolves around teenage waitress Hope, when she moves to the small town of Mulhoney, Wisconsin from New York. Her aunt Addie is a cook and has raised her since childhood, and they have found new work taking over a restaurant there after a man named Gleason Beal steals their money. At The Welcome Stairs, they meet G.T. Stumps, proprietor and owner of the restaurant, Braverman, who runs the grill, and many other acquaintances and workers of The Welcome Stairs. G.T. Stumps has suffered from leukemia and after chemotherapy, has recovered. The leukemia is likely to come back though, and before he leaves the world, G.T. wants to do something for Mulhoney, deciding to run for mayor. G.T. is known as a kind and generous man, but his opponent, former mayor Eli Millstone, has copious amounts of support from a big dairy company that fuels his campaign and provides many of the citizens in Mulhoney with jobs. Even with G.T. uncovering a scam that shows how Eli is stealing money from all of the citizens’ taxes, competition is high. Hope tries to help G.T. succeed with his campaign against Eli while making new friends from high school that also support his campaign, mending relations and doubts with her mother, and receiving G.T. as an unlikely new father, when he ends up together with her aunt. In the story, the author uses a writing style similar to that of the main character narrating to the reader, and uses many food-related words and vocabulary. The word choice is slightly challenging but for the most part comfortable, and is recommended for the age group of twelve years of age and above. The story has a political spin which is a recurring theme all-throughout, and though I think the plot is amazing, for people who abhor realistic fiction, I would not recommend this book. Out of ten stars, I would recommend this as a nine. 1. 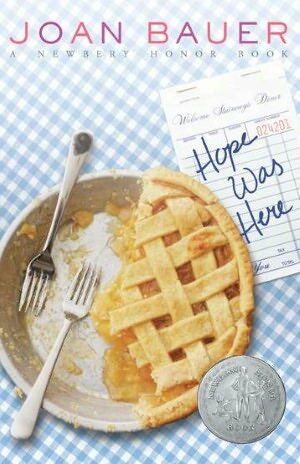 Why does Hope write ‘Hope Was Here’ and tape it on The Blue Box when she leaves? 2. Why is it important to hope and Addie to watch the customers coming out of the restaurant before they themselves enter? 3. What is the reason that Addie and Hope go to Mulhoney, Wisconsin? 4. Why do people have doubts about voting for G.T. Stoops? 5. How does Lou Ellen treat Hope? 6. What is the result of G.T.’s confrontation with the man in the black hearse? 7. How does Pastor Hall convince the Election Board administrator to extend the ballot time limit? 8. What happens to the Daylily Mavis gives Hope, and what does it symbolize? 9. What does the poem about zebra stripes mean? 10. What happens when houses are robbed, all of which are houses of people who support G.T.’s campaign? 11.What does the boat in the painting symbolize? 12. Why is Hope intent on having Mr. Woldenberg warm up to her? 13. What happens to Hope when she meets her mother? 14. How does G.T. win the election for mayor at the last minute, even with his cancer? 15. Why does Hope read her letter to Gleason Beal to G.T. instead?